What kind of man does a woman really want? Hint: It's not Homer Simpson. Ben is sensitive and tries hard to please Miriam, but when there's a problem that needs to be dealt with, he seems oblivious. When she asks for input on a decision, he says, "It's up to you." He wants to be nice but he doesn't realize he's frustrating her. I understand why Ben is unsure of his role. Like a lot of men these days, I received so many messages on what a man in a relationship should be, I was bewildered. Every few years, the media tells us new ideas about what a man should be. For a while there was "sensitive new age guy." Then there was "metrosexual" and advice that men need to develop their feminine side. I've heard married men advise younger men that the key to a happy marriage is: "Yes, dear." I've received emails filled with jokes that ridicule men -- like what's the difference between a man and fine wine? Wine matures. On television, we've gone from Father Knows Best, where the father was a wise caring man who could do no wrong, to Homer Simpson, a buffoon who can do nothing right. 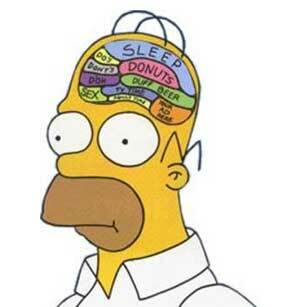 Does Homer actually influence what people think a man should be? In a recent survey in Canada by the research firm Ipsos-Reid, more than 25 percent of fathers aged 18 to 34 identify with Homer Simpson when they're talking to their kids about a difficult subject, and almost 20 percent of adult children in the same age range associate their own father with Homer. With so many confusing ideas, I started looking for wisdom on what a man should be in a relationship. I read books on marriage. They didn't say anything to me. I read Jewish books on marriage. They had a lot of wisdom, but I was looking for more advice on what a man should be. Then I went to the original Jewish sources. I started with Adam -- the first man in the world who was in a relationship. Adam was alone. He wanted a wife. He asked God for a wife and God created Eve to be an "ezer k'negdo" -- a helper opposing him or a helper against him (Genesis, 2:18). A helper against him? What in the world does that mean? I looked in the commentary at the bottom of the page which quoted the Talmud, "If the man is worthy, the woman will be his helper; if he is not worthy, she will be against him." This one sentence changed the way I looked at relationships. The message: It's up to the man to make it work. It's his responsibility. Stop blaming others. If a man works on himself and develops himself to be worthy, the woman will be his partner. If he doesn't, she will be against him. What happens next in the world's first relationship? Adam and Eve are in the Garden of Eden. They have one commandment: Don't eat the fruit of the Tree of Knowledge. Eve eats it and then she gives it to Adam. He eats it. Then Adam hides in the bushes and God asks him: Adam did you eat the fruit from the Tree of Knowledge that I commanded you not to eat? What did Adam do? Did he take responsibility for what happened? No. He says to God, "The woman you sent me gave it to me and I ate it." I couldn't believe it. He gave in to something he knew was wrong and then he blamed his wife. I thought only men today did that. Does blaming his wife help Adam avoid responsibility? God doesn't say, "Adam, I understand -- she pushed you into it. You're not responsible for what happened." Just the opposite. He punishes Adam for eating the fruit, and for not using his own judgment. I think it's significant that one of the first lessons in the first chapter of Genesis is about what a man should be in a relationship. My search led me to discover a lot of timeless wisdom that for generations fathers taught their sons -- wisdom that is so relevant today. Today's absent father, either from long hours of work or divorce, means many boys grow up without a strong male role model. Learn from Adam. Don't do things you know are wrong and then blame others. If you make a mistake, take responsibility for your actions. One of the meanings of the word "husband" is someone who skillfully manages his household. A manager takes responsibility. As Adam experienced, there is little sympathy for a man who blames a woman for something that has gone wrong. He's often still held responsible. People will ask him, "Why did you let it go on?" A man has to look at himself and see how he can change his own actions to properly handle similar situations. If a man wants to be seen as worthy and have a good relationship with a woman, he has to show leadership. When he sees a situation that needs to be dealt with, he should step forward and handle it. People admire those who step forward to handle difficult situations. We don't admire those who stand back and wait for others to solve the problem. Some men avoid taking the lead because they don't want to be criticized. They think they're playing it safe. A man should say, "I'll handle it," and take the initiative to find solutions. If he's not sure what the solution is, do what other leaders do -- consult the many sources of information available. One of the meanings of the word "manly" is being decisive. A man needs to make decisions and take responsibility for the outcome. If he's reluctant to make decisions, she may resent him. Part of making decisions is understanding the other person's views and being flexible. She doesn't want someone controlling her, but she also doesn't want someone who leaves every decision to her. A man who is afraid of making a wrong decision should ask himself: Who should make decisions? -- someone who isn't afraid of making mistakes. The Talmud asks: Who is strong? He who can control his passions (Ethics of the Fathers, 4:1). Someone who can control his anger is better than a physically strong man who can conquer a city. Blowing up in anger can seriously damage a relationship. If a man thinks he can't control his anger, he should imagine being angry at someone, the telephone rings and it's his boss. Would he calm down? Of course, or he'd lose his job. Not getting angry doesn't mean he accepts bad treatment; he calmly sets limits on the treatment he accepts from others. Being manly is not being macho. Manliness is the positive qualities of decisiveness, strength in one's convictions, confidence, self-reliance, high moral qualities, self discipline, honesty and integrity. A man who is manly has courage to be able to deal with difficulty, pain or danger without backing away despite his fear. To women: ask your husband to read this. To men: If after years of watching Homer Simpson, you haven't heard these ideas before, ask your wife if this is what she wants. You may be surprised at her response. If you want to learn more, read Elliott Katz's book Being the Strong Man A Woman Wants: Timlesss wisdom on being a man -- available from Amazon.